[Johannesburg, 26 January 2005] - Eurocom Corporation, a leader in desktop replacement notebook technology since 1989, has launched a new high-performance mobile workstation featuring a choice of upgradeable video cards based on 16x PCI Express architecture with 256MB of DDR video memory. The new super powerful EUROCOM D700T Enigma notebook powered by Intel Pentium 4 processor up to 3.8GHz featuring 15-inch display, an optional second hard drive and second optical drive, is designed for graphic dependent professional users such as CAD designers, 2D and 3D designers, engineers, architects, scientists, researchers, photographers, animators, video and audio producers, game developers and players. Today's graphic dependant computer users, artists, CAD designers, photographers, know all too well that the difference between a good video card and an inferior one can mean the difference between getting the project done correctly and on time or losing the contract. Not only are type of card, video RAM and the capabilities of the card to be considered, but with notebook video cards they may not ever have their own video RAM. Shared video RAM is not sufficient for high-end graphics computing. Many models on the market are designed to save space and power consumption to streamline the main board design. When it comes to high-end graphic requirements, the more system RAM, the better the final result. When the video output can take up 128Mb of memory, isn't it better to let the video card deal with the graphics? Onboard video also streamlines the processing of the video; all graphics work stays on the board, not clogging up the system RAM, CPU and Bus bandwidth. When it comes to a notebook with its own video RAM, traditional notebooks limit users to the video memory that the notebook was sold with. The Eurocom D700T Enigma introduced an answer to this problem. No longer are notebook video cards built onto the main board. A video card slot makes the desktop replacement notebook one step closer to the capabilities of the behemoth computer that is sitting all over your desk. The D700T model takes the removable video card to the next level; it's upgradeable, and not proprietary. It means that when Eurocom brings out the next generation of video cards, when 256Mb video becomes 1GB, the notebook can be upgraded. The newly released D700T Enigma allows for the choice of video cards at purchase. A user can choose from one of three video cards tailored for his computing needs. The originally released upgradeable video card, Nvidia's GeForce 6800 Go, boasts the world's first fully Microsoft DirectX 9.0 Mobile GPU with support for Shader Model 3.0 and full support for high-definition DVD and video playback. To give the options some balance, Eurocom breaks out the ATI Mobile Radeon X800. This card targets the gaming enthusiast by delivering increased visual performance with 12 pixel pipeline, DirectX 9 performance, 6ix vertex engines, 3DcTM technology for increased performance and improved image detail, GDDR3 memory for lightning fast memory speeds, VIDEOSHADERTM HD and 256-bit memory interface for support of 256MB mobile designs. Eurocom takes this good idea another step; to ensure you get the card best suited for your needs, it has introduced support for the next-generation Nvidia Quadro FX card with OpenGL. OpenGL provides a complete feature set for 2D and 3D graphics operations in a pipelined hardware with accelerated architecture for triangle and polygon rendering. In a broader sense, OpenGL is a powerful and generic toolset for hardware assisted computer graphics. The EUROCOM D700T is enough to elicit a puddle of drool from any LAN partier. Weighing in like a tank (about 10.2 pounds), but powerful as one, too, the D700T blew our competing Centrino units away on performance. 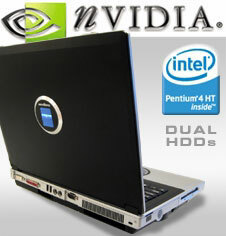 The machine comes with ATI's latest Mobility Radeon X800 GPU, 1GB of DDR, and a 3.4GHz Pentium 4 550 desktop CPU. We were literally made aware that this beast will sizzle after prolonged stress. There are four fans on the bottom, in addition to CPU and GPU heatsinks in the rear with twin circular intake vents on the sides. Mind your fingers around the CPU heatsink grille. The D700T's looks are pleasant (14.2 x 11.5 x 1.5 inches), styled in black, silver, and charcoal. We grew to like the odd circular touchpad and integrated scroll wheel, and EUROCOM builds in a BIOS-based CD and FM player that operates without an OS boot. Buttons below the wrist rest let you control playback with the screen closed. Two up-firing speakers flank the buttons, with two down-firing speakers under these. This quadrophonic approach still needs a subwoofer, though, as the effect is still weak for good music. There's no need to dwell on benchmarks; the D700T screamsperhaps too much. Before we could finish testing, we closed the system for a moment, opened it back up, and where a Windows Desktop had been there was a black background with two vertical lines. Safe Mode came up fine, but Normal Mode only showed the lines henceforward. EUROCOM had no updated drivers as of this writing. ATI noted it had seen the problem once before with a loose lead from the screen to GPU, but reinserting the GPU module firmly had no effect. (We did notice one nut securing the module to the motherboard had snapped off, although the screw was holding. About the only power feature missing look to be a RAID setup. There's room for two drives (one internal SATA or IDE and one via a modular bay but IDE only). There isn't a way, however, to easily access the RAM. There's no bottom hatch, and we couldn't devise a safe way to get under the keyboard without any instructions. EUROCOM's official line is that factory-authorized techs should handle all upgrades. You may never need to upgrade from 1GB to 2GB, but EUROCOM makes the prospect daunting. Still, there are tons of extras. The integrated Web cam delivered surprisingly good video, and there's an onboard AVerTV tuner linked to an external mini connector. The adapter option didn't ship with our unit, however. There's also a 1/8-inch connector for SPDIF output, SD/Memory Stick slot, and floppy drive. Figuring that our glitchy unit was probably a fluke, we're confident this notebook has the goods for high-end performance.